Discover our Nations Capitol on this exceptionally comprehensive 4 hour personalized, professionally guided tour. Our small group format is limited to 12 guests. We cover everything! You'll view the US Capitol, White House plus America's iconic Mall Memorials- Lincoln, WW II, Korea, Vietnam and Martin Luther King Jr. The Tour includes Tidal Basin favorites- Jefferson and The Treasury Department's BPE- where our currency is printed. We conclude with close-up views of the Pentagon & Iwo Jima in nearby Virginia. Ride in comfort in our well appointed Tall Roof Transit Van - including phone chargers, umbrellas and complimentary water. View dramatic slides and videos of DC on our Transit's flat screen. Make your time in Washington, DC, truly unique by joining us on your next trip. We will also drive past several Smithsonian Musueums, FBI Headquarters. US Treasury, and many more. 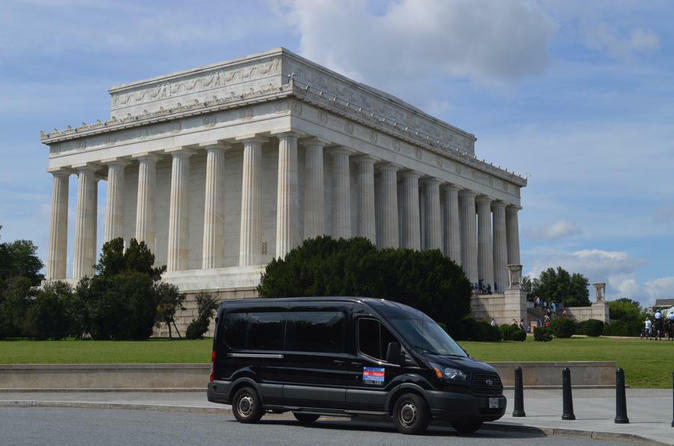 Enjoy touring with a professional guide to ensure a wonderful experience in the nation's capital. Tours begin at the Smithsonian Castle with a tour of the Castle and an introduction about the history of this amazing Washington DC Treasure. Explore Washington, DC, on this personalized 4 - hour tour.